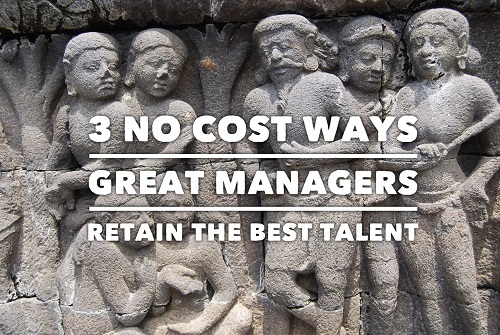 Every manager can build employee loyalty that is recruiter resistant by using 3 quick and easy common sense tactics. Are you losing or worried about potentially losing key talent? 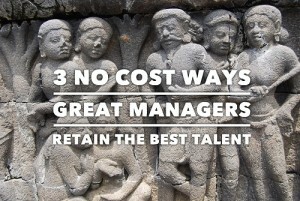 Are you failing to make counter-offers that win when your employees tell you they’re leaving? This is a huge talent management challenge for most organizations, and it is only getting worse in a super-hot global job market. You may not be able to persuade those already half-way out the door to stay but you can start building an impenetrable wall that is recruiter resistant. It doesn’t require budget dollars or massive time commitment. All it takes is a little common sense. Here are 3 quick and easy things you should be doing every day to build airtight employee loyalty and employee engagement. Gratitude is the most powerful way to reinforce a person’s importance. So when is the last time you shared a heartfelt thanks with someone? When is the last time someone did the same for you? That’s the problem. People just don’t give thanks enough. Fortunately, it’s an easy-to-fix problem. Make it a point to genuinely thank at least 1 employee a week. Schedule it on your calendar, and use your smartphone or other tool to capture notes to craft your statement of thanks. Pretty soon your expression of gratitude will become a habit, and you’ll start to see an increase in smiles and employee contributions. The bigger the title the more likely you’re a victim of destination disease. It’s a normal tendency to stop attending training and / or reading books and trade journals once you reach a certain title. After all, you have years of experience and intense daily responsibilities. The by-product of managers suffering from destination disease is this – they stop asking for employee input or listening attentively to them altogether. Unfortunately, that’s a serious profit-destroying mistake however, it is also an easy-to-prevent and treat management mistake. Ask your employees questions to obtain their input. If you’re a regular reader of my blog or have attended my leadership training, you know I preach asking “what” and “how” questions. The real trick is to actually listen to their thoughts and ideas. And that leads to the third and final common sense tactic. Too many people are hell bent on sharing their ideas with very little interest in hearing the ideas of others. Smart and successful managers know the ideas of a single contributor are multiplied 10s to 100s of times by the contributions of the many. They never let their ego and pride get in the way of achieving maximum results from their team. Use brainstorming techniques to obtain and refine ideas. But make it fun and engaging. Have a contest. Let the creativity flow. Capture the best ideas, and then execute them. By creating a culture of contribution and innovation, people will absolutely love working for you. Give thanks. Ask questions and listen. Execute their best ideas. Pretty simple, common sense tactics that cost nothing more than 10 minutes a day to do. Smart managers increase employee engagement using these common sense tactics so give them a try. Do these for 30 days straight and then assess employee engagement or satisfaction. Do it for 90 days, and you’ll likely have established a higher level of employee loyalty that is impervious to new job offers. What other employee-loyalty increasing tactics have you used? Please do share them in the comments below. Need help with increasing employee satisfaction and engagement with your management team? Want more insights as to how you can position your management style as a recruiting and retention advantage? For more practical tips and strategies for preventing the loss of your best talent, subscribe to this blog, explore more of this website, and follow me on social media (Twitter, LinkedIn, YouTube, Instagram, and Facebook). By doing so, you will have access to daily inspirational and motivational quotes that will drive your success trajectory upward. So don’t delay, follow me and think yourself to success today!